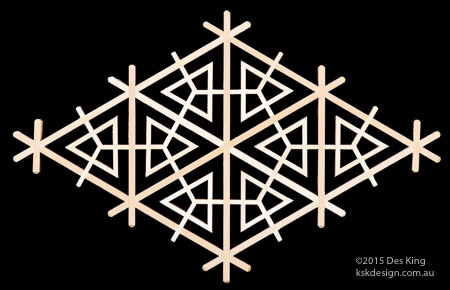 This new pattern for Book 3 is called the komachi kikkō, and is quite straightforward to make. Komachi (小町) means "small town". It is also the name of a town in Kamakura, a city in Kanagawa Prefecture. Kamakura was the seat of the Shogunate and the Regency during the Kamakura Period (1185–1333), and, historically, Komachi was the site of a bustling market in front of the local shrine. Today, the town is a popular shopping area with many coffee shops and restaurants. 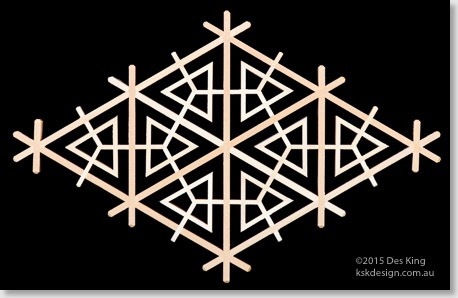 I'm only guessing, but with the name komachi, this pattern may be a representation of the stalls that formed the Komachi market in ancient times. But, as I said, this is only a guess. Whatever the origins of its name, though, it is a very attractive pattern.